As many of you have already ascertained, this being tossed to and fro in these undulating waves of energy is by no means over yet, but we do hope that you have all been able to get a mouthful of fresh air at least once during these proceedings. We venture to guess that for many of you, the effects of all of these constant surges of wavelike energy will feel somewhat different from what you have been exposed to before, and rightly so. For you have indeed been raised not just another notch this time, rather, you have all been raised to a whole new level of existence to call it that, and therefore, the effects from what is constantly being beamed onto your planet and into your whole system have changed drastically. To your physical body, much will feel the same, but in fact, there are some dissimilarities from before. But as they in some cases are rather subtle, you may find it hard to hear the different resonance this is making throughout your whole system. For the tune has indeed changed, and so have you, and as such, the melody being played out by each and every one of you has also changed. And together, the choir you make up has changed its tune in such a way, the whole of Creation is able to perceive it. And yes, this will indeed affect us all, and as such, the reactions to it will also change. In subtle ways, but also in some more noticeable ones. For remember, there are still those around trying with all of their might to quell these sounds of revelation, and as such, they will also feel forced to up the ante in any way they can. Hence the somewhat surprisingly vehement attacks some of you have encountered lately. For remember, your voices and your mere presence signals the arrival of a light that is becoming more and more brilliant, and for those eyes still more accustomed to shading themselves by constantly being focused on the dimmer regions of your planet, this brightening light will feel like it is almost piercing into their brain, even into their very core. So they lash out in protection, and anyone standing in their way may feel the brunt of these attacks. So it can be hard at times standing in this new light, for it exposes so much not only within yourself, but also within those around you, and that can indeed be painful in so many ways. For what you see it not always easy to digest. But again we say, you are exactly where you are supposed to be, and no matter what arises in these next few days, whether it is within your own sphere or it is on a more macro level, know that all is well and everything is happening for a reason. Remember, this is not ”judgement day” in any connotation of the word. For this is neither doom nor a final reckoning of anyone’ s feasibility. For this is just the final clearance of anything that may still stand in the way of these arrows of light, and as such, give thanks to whatever you might find popping up in your life at the moment. For it is not coming up in order to make you feel bad in any way, far from it. It is only popping up to show you that you are jettisoning the last remants of any baggage you might still have concealed somewhere on your person, and this baggage must go in order to help you take that final step forwards. So again we say, this is a process that can seem to be bewildering, as you will feel yourself being tossed between a complete state of bliss one moment, for then to be thrown into confusion by something that suddenly materializes in front of you. But even if it might seem like it to many of you, this is not a case of one step forward, two steps back. For no matter what you experience now, whether it can be looked upon as smooth sailing or fighting for breath, they can all be considered as steps forwards. So rest your weary heads and your confused bodies, and know that you are constantly being propelled forwards, in the best of ways. For we are helping you to keep putting one foot ahead of the next, as we see to it that you are gently guided to look in the direction that will give you the best of opportunities to find the most effective way to advance. And remember, you are not alone in this, and even if it all comes down to each and every one of you how you want to tackle this journey, you will have access to all the help and assistance you need in order to be able to fulfill this quest for glory. And glory is what you will find, no matter how deep you seem to be mired in the old muck at times. For you are not stuck there, not in any way, and the moment you realize this, you will not waste any more time fighting against it all. For surrender is once again the key word here, as to surrender is not to give up, it is merely to accept this process for what it is. And when you do this, you will indeed find yourself being carried on a swift current towards that final resting place, where you can simply step into your completeness and leave all of this toil and worry behind. So here we are dear friends, ready to begin another day in paradise. For that is truly what it is, is it not? We do not say this in order to offend anyone still in the throes of the last birth pangs, we just say it as a little reminder that you are not left out, any one of you. For you are already in paradise, and even if you for some reason have yet to come to the same conclusion yourself, let us just say that deep within yourself, you have, and soon, the rest of your awareness will follow suit. Let us explain. As we have stated on so many an occasion, if you venture to look for paradise outside the confines of your own self, you might find quite a lot of traces of it, in the beauty of nature, and in the loving look from another soul’s gaze. But if you focus on what is still abundant around you of sorrow, misery and mismanagement, you will come to no other conclusion than that you are still living in something that for many can only be described as a nightmare. But again, it is a nightmare, for it is truly an illusion, and as such, the moment you yourself fully awaken, you will see it for the shimmering haze of make believe it really is. For that is not permanent, not in any way, and all of that will start to dissipate as soon as you start to emerge from this cocoon of transformation. For when you do, you will see that you are permanent, as you are in all ways and manner immortal. And so everything else are just undulations of energies, ebbing and flowing around you, but no more than a chimera. In other words, once you are truly reborn back into this, the truest version of you, you will begin to look upon what surrounds you with a far more discerning eye. Then you will see that there are no absolutes in this so-called ”reality” that seems to be pressing in on you. For it is but a fiction of the human mind, put up as a sort of play acted out under the pretense of being real. But it is not real, no more real than what play-actors present on stage in theatres. And just like a play, no matter how popular it has become, it will sooner or later have to go out of production. For a play will only continue as long as there are people willing to come and see it. And now, as you awaken one by one, you will leave your seats and exit this ”theater of life”, as we like to call this third density performance of ”reality” that you have been avidly watching for so long. For remember, you have all had an affinity for this play, for at first, you too were an intrinsic part of it as actors. But as soon as you started to open up and go within, you left center stage and gradually retreated into the stalls, where you kept a close eye on what was going on at the stage. But now, the time to leave the playhouse altogether has come. For now, it is indeed time to re-enter the real life, and start to live in manner that befits your new status as creators. For that is truly what you are, real life creators. For yours is no longer the role of obedient actors, catering to each and every whim of those dictatorial directors, shouting out from the wings. Nor is it the role of willing spectators, engaging hungrily in every nuance of what is being played out in front of you, gasping in horror or chuckling in delight at each cruel joke or nasty barb being uttered from one of the actors. For now, you have your own life to play out, and as soon as you understand this, you too will realize that it is time to leave your seat in this old and run down ”theater of life” and go out into the sun and start to live you own life as a free citizen of paradise. For it is indeed a paradise that you are living in, and this becomes apparent as soon as you open your eyes and open your heart and start to drink in all of the beauty that is already here. Not only in Mother Nature, but also inside each and every human being you come across. For you are truly citizens of paradise, and you will make this whole planet into a veritable paradise as soon as you stop looking back over your shoulders at the actors making their desperate attempts to entice you back into their cramped and airless little playhouse. For you have yourself now, with which to play out the full and free life you have always dreamed of. A life that is not incomplete in any way. And you have everything at your disposal, there is no lack of funds nor of resources, as you are once again connected to that all-encompassing lifesource that is running throughout All of creation, and the sooner you realize this, the better. For then, you can all start to create from the heart, for that is where this true connection resides. And once you start tapping into this truth, you will never ever run out of steam. And then, you will start to engender so much, not just from yourself, but from this whole web of like minded, or rather free minded, souls that are starting to emerge all over your beautiful planet. For you will all see just how overwhelmingly satisfying it will be, not only to finally be out in the fresh air, but also how unbeliveably satisfying it is to finally get to create something that is real and true and everlasting. And that, dear friends, is the true paradise you have just entered. The undertow will be strong for many of you now, and it will feel as if your feet are in danger of being swept away. And so you think you face certain destruction, for when you venture to feel into these energies surging around you now, you can feel just how powerful they are. But in this, the lesson is the same as for those caught in a riptide when they are out in the waters. Do not fight this dear ones, for then you will only prolong your pain and misery, and you are apt to tire yourself out completely. For what you need to do is to go completely against your instinct. For your instinct will tell you to hunker down and fight with all of your might against the relentless push and pull if this surge. But what you need to do, is the complete opposite. For you need to just lift your feet, release your hold on the firmament, and let yourself ble swept away on these currents. And when you do, you will find it is so much easier to navigate this stream of incoming energy, and you will find yourself floating freely in this large body of water. For if you stick to your guns, you will find yourself fighting for air, as the water rises and your head starts to become submerged. So again we say, do not fight this, but surrender to this, and you will find your breath slowing down, and you will be better able to tune into your own heart. And when you do, you will find all of the assurance you need. For your heart knows that you are not drowning, you are in fact being propelled upwards and forwards, and so your heart will go on, in a steady and powerful rhythm. So again we say, stay connected to your core, and all will be well, and follow your heart and let yourself fall into the loving embrace of this undulating wave of love and light. I feel myself slowing down, connecting with myself, spending time in solitude, out in Mother Nature. My body still have these strange shifts between lightness and an almost foglike heaviness, where I cannot even think. But underneath it all I feel the new vibrations as this very solid foundation, giving me so much assurance that I have in some ways “arrived” after all. As always, reading all that you share in this space brings me much joy, and it has been so beautiful to read the descriptions from those of you who took part in the group mediation. Philip, thank you for setting up this “special edition” of your weekly meditation and inviting all Uniponders to take part. I have been “disconnecting” myself lately to better be able to flow through all that is happening to me now, but I have been told that I am to invite you all to a “Gathering around the Pond” as soon as “the dust settles” as The CCs put it. I think you all have felt how the energy in this space has grown so much lately, and judging from the images you shared from your meditations, it will be a very, very powerful experience once we can all sit down and connect. Until then, I send you all my love and light, and I thank you all for your presence here. You have all poured your light into this beautiful Pond, and it will continue to increase in clarity, brilliance and size as we all let the light continue to flow through us. The song inside of you have changed its tune now, and even if it might be difficult to decipher between all of the clamor these new energies have created, it is there, and it is constant. So do not fall into the trap of thinking that these last few days intense upheavals have thrown you off the track, far from it. But as we told you earlier, the buttons would be pushed by these incoming energies, and pushed they have been. To the extent that for some of you, a sudden breakthrough has suddenly arrived, as if out of the blue. As breakthroughs goes, these have been so profound, they will literally change the whole landscape around you, as you seem to have been walking on a foggy moore and then suddenly emerge in a very different landscape where the air is crystal clear and sharp, and everything stands out in vivid detail. This is not an easy journey for any of you, but for some, these last few days have been more challenging than you can mayhaps ever remember, and as such, this process will for quite a few of you still take some time before it all settles down, and you too will be better able to discern all of the details around you. For this is indeed that last stage in the desert if you will, when you will all start to see something shimmering on the horizon, and this time, it will not be a trick of the eye, but it will be the first sight of your final destination. And what is your final destination? It is not a city of gold and treasures, inhabited by fleet footed maidens and handsome warriors. No, what we talk about, is that golden city within, the one that has always been there, but one that for years and years has been neglected. Not out of spite, but because you were not even aware that it was there. But last week’s intense shower of love has washed away all, or at least the majority of debris that have been covering up this fabled city, and now, it cannot be hidden anymore. Not from you, nor from others. For the lights in that city are coming on, one by one, and they are starting to draw your attention, whether you like it or not. For some, they are already dancing in the streets in a happy reunion with themselves and this inner city of gold, while for others, they have still a little bit left on that road towards it. But you have all, in some ways, been made aware of this fabled place, and you can feel it beckoning inside of you as an irresistible force. Remember, each one of you have your own way of arriving in this city. For some, it will be through an almost traumatic and painful recovery of the memories that are kept within the walls of this place. For others, it will almost feel like you stumble upon it by sheer luck, and the list is long. So again we say, do not follow in the footsteps of others if you want to rediscover this fabled city. For then, the road will quickly peter out, and you will leave yourself stranded in the desert. So make sure that you are very present in yourself, and seek the ways that will help you to do this. For only you will know how to look, if you have not yet arrived. So again we say that all is well, no matter on what stage of this final journey you all are. For you are just where you are meant to be. So breathe deeply, and celebrate, whether you know you have arrived, or whether you are facing that final hill where you know you will be able to set your eyes upon that final resting place. For this is where the true you reside, and this is where you will be reunited with yourself once and for all. So again, we wish you all god speed, on this, the final push within. And if you have arrived, you will know so, because then it is as even the colours start to change hue, and the light will brighten, and so will you. These last few days have been full of magic, but also so intense, so I had to take some time to just BE. For the energies that blasted through me on the Equinox were even more powerful than I thought, so I literally had to disconnect myself from everything, including this Pond, in order to get back to myself. In this exhilaration of all the love that came rushing in, it is easy to get carried away. But just as the butterfly in the beautiful video Michael posted, we need to take time to sit with all this before we throw ourselves fully into this new level. For if we act too fast, we risk crashing down because our wings are not yet fully formed and ready to make us airborn. For it is just like the CCs said, we have been given the opportunity to find our new voice, but we can only find it if we take time in quiet to listen for it inside. Many of you have done that, and the stories you have shared here these last couple of days are testaments to that. Alex, Guerric, Iain – you are just some examples on how these new energies have worked miracles. For you did just that, you stepped back and stepped into yourselves, fully and truly and in ways that are shining examples for us all. I thank you for sharing these profound, transformative stories with us, for you have dared to be honest to yourselves in a way that is beyond anything I have ever seen before. For you have found your new voices, and they are beautiful, soaring up to heaven, and you bring joy into the hearts of us all. The tune of this Pond has also changed with these new vibrations coming in, and the stories you have shared show that very clearly. And when we start to connect even deeper through this Pond, as in the group meditation Philip has set up for Monday, it is even more important that we all take some time before that to literally ”tune out to tune into ourselves”. For have you found your new voice yet? It may not feel very different from the old one, but believe me, it is. You may not have to go through a deep and profound experience in order to find it, but you need to be sure that you have in fact managed to establish just who you are after this intense energetic retuning. For some of you, that process will take some time to finish, and so you will have to give it all the time you need. But then at least you will know that you are still in the process of fine tuning yourself. And that is all it takes. So please make sure that you are honest with yourself in this process, and do not rush ahead without taking the time to listen well to that inner voice. In other words, make sure that you have managed to tune into this new vibration, as otherwise, you will find yourself out of balance again very soon. For this new level of vibration is so powerful and so strong, and if you try to ”wing it” as they say, you will be blasted back down again until you learn your lesson. For we cannot sing the old song anymore, it simply does not harmonize with the new, and you will feel the effects of being ”out of tune with yourself” even more now than what we did before. Because the energies have changed so much it will clearly signal if you are, and it will do so without hesitation. It is easy to get confused, and it can be distracting to hear everybody else trying out their own voices. So make sure that it is YOUR voice you hear, not that of someone else. So take time, disconnect from the outside and go within. That way, you will know just what your new voice is, and when you raise it to the heavens, it will mix in perfectly with the new vibration that is already here. Remember to be patient with yourself, and ask for assistance if you need it. I had a hard time hearing myself above the noise my physical body made in the aftermath of the Equinox, and even being out in nature was not enough to help me to balance myself. 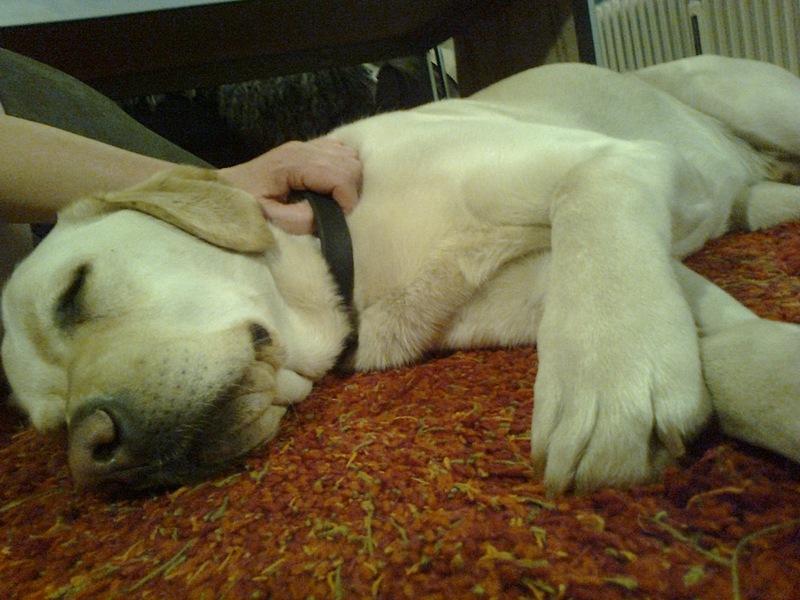 And so I asked for help, and got it in the form of this beautiful dog that I was asked to look after for a few hours. This gift of love gave me the opportunity I needed to just let go of everything and just BE in the love that he gave me. And so he helped me to hear myself, and for that, I thank the infinite wisdom of the Universe. So please make sure you give yourself the same gift of tuning in, and I know you will find your way through the noise and into the new music that has started to play within. Today is another great day indeed, but one that will be met with indifference from many, for this day will be all about integrating what you have already been injected with, but also one that will bring with it new and improved levels of understanding. But again, this does not pertain to all humans, as this only pertains to those who have already opened their hearts to this, and who are welcoming these heavenly injections of light and hope. For the rest of humanity, it will seem to be more of the same old, same old, as they continue to drag themselves through another day of this mortal coil. Make not mistake, life can seem to be much less than bleak for many of your fellow men and women even without these injections from above, for all is not pain and unhappiness. But their joy cannot be compared to the joy that is yours, as soon as you have opened the doors within that let in these heavenly emissaries. For then it is as if the volume has been turned to max, and the mufflers have been removed, and as such, the exhilaration will be multiplied many times over. In addition, when you reach out and connect to other open souls as you are doing here in the space that has been set aside for such a purpose, you will feel that this also heightens the intensity of all of these positive vibrations another notch or two. For that is what this truly is at heart, good vibrations. But if you refuse to reset your receiver and tune into this new channel, you will not be able to pick it up, and all this heavenly music will literally pass you by. So again we say stay tuned, for there is more to come, and even if it at times can be a little bit taxing to receive these heavenly signals, know that the outcome is certainly more than worth it. For the choir you have set up has already acquired many new members, but the roster is about to multiply even further as you yourselves have started to emit this wondrous voice from heaven from your own hearts. And now, this song is being picked up by more and more eager ears, or rather hearts, and they will be attracted by this tune and come knocking on your door, ready to hear more. And as long as you keep singing in tune with this new vibration, you will be able to make even more join in and harmonize alongside you. And they again will entrain others with their new vibration. And on and on this goes, like a veritable train of love where new cars are being hitched on one by one. And so again we say look around, and see that you are already swimming in a sea of love, created by each and every person who has had the courage to open their own heart and pour our the contents within, increasing the size of this beautiful pond beyond belief. But this is only the beginning, dear ones, and know too that there are other ponds just like this, already brimming over with the love that has accumulated there. And soon, these ponds will start to merge and intermingle, growing outwards and covering more and more of the surface of this little blue planet of yours. And soon, when you look from above, the waters of these small ponds will have outgrown even the vastest of oceans you can see from outer space. So we thank you all, for doing what you do, and for being what you are. For you are the ones making all this happen, step by step, song by song, choir by choir. So sit back and listen well, for you are indeed already an integrated part of this heavenly choir, already being heard near and far throughout the lands. And the song that you sing, is indeed the song of freedom, finally being sung by those that have attained that freedom. It is not a song of longing any more, it has become a song of being. And with that, we will leave you for today, but we will return again and again to continue to sing your praise. For it is well deserved, more than you can know, and so we stand here today, applauding your efforts. For the sound you are all making is soaring through your universe and beyond, carrying with it the confirmation that mankind is about to break out into a song that will break all the records hitherto set by this human race. I am here, do you have a message for me? We certainly do dear lady, and tears of joy are running down our face as we tell you this. Beloveds, you have entered the halls of tomorrow, and you have done so in the company of thousands upon thousands of jubilant souls. For last night, you tore yourselves free from the yoke that have been holding you all back for so long. For you are free now, free to explore these lands of no boundaries, free to savour all of the pleasures inherent in a life filled with love. For the light has entered, and with it, all of the borders have been set free. So rest now dear ones, because you have yet to fathom what all of this will entail. For you are still in this transitional phase, and as we said, you have been somnambulants for so long, waking up will feel very strange at first, and it will take some time before you fully understand what has taken place on your beautiful little planet. For yesterday you made a firm commitment to tear asunder the chains holding you down, and your collective power was more than enough to blow your cage to smithereens. So rejoice we say, for you have set yourselves free, and you did it, no on else. For what is a light send out from heavens above if there are no open hearts to receive it? You were all so open, and what you partook in will sustain and nourish you for the rest of your sojourn on this beautiful, blue planet. So again we say, you are the ones who have set you free, and we bow down in respect, and rejoice alongside you. For you are us, and we are you, and now, that will be more apparent than ever before. We willl leave you now to start this day, and to let you feel into this ocean of love with all of your senses. You have arrived dear ones, and know that from now on, your journey will be filled with light in every sense of the word. So here we are dear ones, on this day of joy and celebration. For many of you, this day has already begun during the darkest hours of the night, as we wager that more than a few have had some visitations from some rather intense energies during your otherwise more restful sleeping hours. Well, let us just say that you will have many more encounters like this in the next few hours and days, but know that although some of these visitors may seem to be a little bit disturbing to your physical system, they are all benign. But we have to say they are nothing if not effective, as they charge through, bringing so much awakening in their wake. For this is what is happening to you all now, dear ones. Just as with Sleeping Beauty, one by one you are taken in hand, and gently, or in some cases, not so gently, being risen from that deep slumber you have been in for so long. For you have been somnambulants long enough now, and it is indeed time to become fully awake and survey your new surroundings. For you have grown to expect nothing but sad news and bitterness wherever you turn, but now, as your eyes get used to this new daylight, you will see how the sun has drawn out so much happiness and beauty all around. That is, if you seek it through the right channels, and do not depend on the mass media to enlighten you. For now you will know that they never will, as they are all still embroiled in the same old, same old. But you will know better, for you will feel the heat from this sun warm not only your face, but also your heart, and you will see a smile of recognition on so many other faces around you. So again we say, take time to celebrate today, and take time to connect, for that is why you are all here. For you are a vast net of enlightened beings covering your globe now, and this time, it is up to you to haul that net even tighter and thereby avoid letting any single one of you fall through the openings. So know that all is well, even if your nighttime and maybe even some of your waking hours will seem to be a bit tumultuous in the time ahead. For you have just started to come to, so your whole system will feel a little bit as someone who has overslept for suddenly to be jolted awake again without much further ado. So let us just leave it at that, but not before we give you all a standing ovation. For you certainly deserve it, and it is resounding throughout All of creation. For you are closely watched by us all, and we are indeed more than pleased by your progress. So thank you again dear ones, for doing what you do and for being who you are, the bravest of the brave in All of creation. You are approaching one of those periods during the year that have always been celebrated amongst human beings. Some of you may not know why, but it is all linked to the precession of your planet in comparison to the other planetary bodies that surrounds you. And tomorrow is one of those days when your planet seems to be suspended in a precarious balance, and if everyone held still, it would continue to do so. But then, slowly, it starts to move again, and the balance between night and day on either end of your globe will once again begin to change. So this is indeed a very symbolic day, but it is more than that. For tomorrow is the beginning of a brand new phase in everyone’s lives, so today is a day to begin to prepare for that. And no, we do not mean prepare as beginning to dig a whole in the ground for shelter and stocking it with provisions, thinking that the end is near. No, what we are talking about, is what will come hot on the heels of today’s lull, namely a huge influx of energy that will literally take your breath away. But in its wake comes something else, and that is why we want you to start to prepare for this monumental influx of energy and information today. For we want you to make sure to sit down in peace and quiet today and literally tune in to yourself, and we think you will be able to discern something new there already, something hiding behind the everyday noise, but still discernable if you listen well. And that is indeed the new you, the voice of the butterfly if you will, and if you manage to check in with that today, you will be better prepared when it starts to raise its voice in earnest tomorrow. For tomorrow will bring in the signal for it to do so, and it will push a multitude of buttons in you all, and the result can be bewildering to say the least. So take this time in this quiet intake of breath to sit down and get to know that voice. For that is the voice you will be hearing from now on. And soon, no matter how much external noise that will be generated in order to drown out this new voice you all carry inside, it will start to ring out loud and clear. Not only on your inside, but on the outside as well. For with your new wings comes also an inability to stay silent no more. For you are indeed the voice of the future, but you have come to tell us all that the future is already here.